Most everyone has heard of The Serenity Prayer. * It’s used to help calm ourselves down before we go and do something incredibly stupid. Everyone seems to agree it works well. Once in awhile, however, it doesn’t seem to fit. Sometimes I’m not in a prayerful mood. Maybe my left brain has kicked in with an attack of “S.O.O.T.” (Sudden-Onset Over-Thinking). I may have an unpleasant flareup from the pain and unsightly itch of Agnosticism… or perhaps I’m just having one of those “My-Will- Be-Done” days. When I’ve amazed myself struggling to change the things I can’t, or wallowed in the misery of not changing the things I can, looking back I see that nine times out of ten before I started I faced a much bigger problem: I couldn’t tell the difference. From that point of view, one could make the case that the Serenity Prayer is backwards. After all, courage is absolutely fabulous, and I’m a big cheerleader for serenity, but don’t we have to have wisdom first? That’s why I created the Serenity Flowchart. Using this, I eliminate those pesky “false starts,” getting all worked up over a pointless struggle, or those embarrassing bouts when I watch everything crumbling around me and do nothing. Now I ask for wisdom right off the bat, and I know without wasting time or energy whether to get busy, or to just lean back and chill! *P.S. 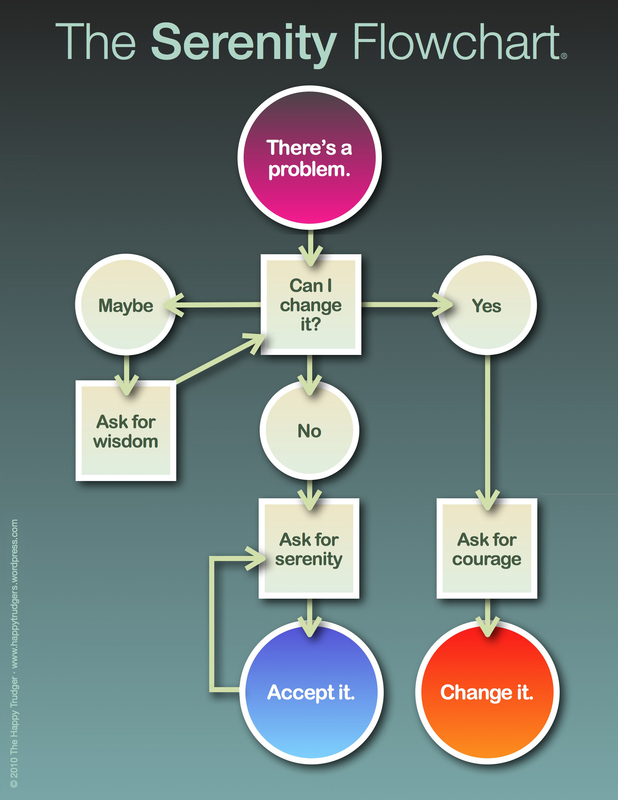 The Serenity Prayer (in its best-known form) reads: “God, grant me the serenity to accept the things I cannot change; Courage to change the things I can; And wisdom to know the difference.” As serenity goes, it has a significantly better track record than the Serenity Flowchart above.